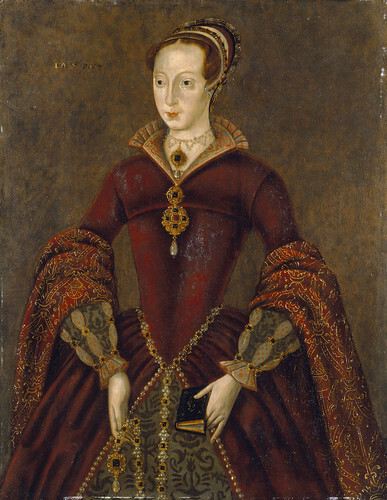 Lady Jane Grey is replaced as Queen of England by Mary I of England after only nine days on the throne. Tragic Lady Jane Grey is remembered in British history as the monarch with the shortest reign… just nine days. Why was Lady Jane Grey’s reign as Queen of England so short? Lady Jane Grey was the eldest daughter of Henry Grey, Duke of Suffolk and she was the great-grand-daughter of Henry VII.She was proclaimed Queen after the death of her cousin, the protestant King Edward VI, son of Henry VIII. She was actually fifth in line to the throne, but was his personal choice as she was a Protestant.Edward’s half-sister Mary, Henry VIII’s daughter with Catherine of Aragon, was actually next in line for the throne but as a devout Catholic, was out of favour. Edward wanted to keep England firmly Protestant and he knew that Mary would take England back into the Catholic faith.John Dudley, Duke of Northumberland, was Protector to King Edward VI. He persuaded the dying young king to will his crown to Lady Jane Grey, who by coincidence just happened to be the Duke’s daughter-in-law. Edward died on 6th July 1553 and Lady Jane ascended to the throne with her husband Lord Guildford Dudley at her side – she was just sweet sixteen. Lady Jane was beautiful and intelligent. She studied Latin, Greek and Hebrew and was fluent in French and Italian. Queen Mary IHowever the country rose in favour of the direct and true royal line, and the Council proclaimed Mary queen some nine days later. Unfortunately for Lady Jane, her advisors were grossly incompetent, and her father was partly responsible for her untimely execution as he was involved in an attempted rebellion.This was the Wyatt rebellion, named after Sir Thomas Wyatt, who was an English soldier and a so-called ‘rebel’. In 1554 Wyatt was involved in a conspiracy against the marriage of Mary to Phillip of Spain. He raised an army of Kentish men and marched on London, but was captured and later beheaded.After the Wyatt rebellion was quashed, Lady Jane and her husband, who were lodged in the Tower of London, were taken out and beheaded on 12th February 1554. Guildford was executed first on Tower Hill, his body taken away by horse and cart past Lady Jane’s lodgings. She was then taken to Tower Green within the Tower, where the block was waiting for her. This entry was posted in Uncategorized and tagged 1553, 19 July, Lady Jane Grey by admin. Bookmark the permalink.